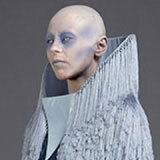 The bald Umbaran woman elegantly stepped into the oligarchy of Umbara. Her name was Sly Est and was one of the most influential individuals within the Ghost Nebula. The cold and dark chambers echoed the welcome of Sly. The council grew more and more resistant to her will, seeing as her popularity began to rise. She was not one to be trifled with. "Magistrate, your reign has finally come to a close." Sly Est's face remained without a smile nor grin. The Magistrate looked at her and unaffectedly asked, "Our options?" Power always appealed to the council, in fact to every Umbaran, but Sly Est knew exactly this planet's fate. They would join the Galactic Alliance, one way or another. Sly Est had the Ghost Nebula at a stand still and she would win the civil war either way and the magistrate council knew of Est's abilities to manipulate even the gifted Umbarans. Can I ask? Is this character one of Alex's friends trying another planet shift for him? Why dont you shut up and go play with your little toys, I mean, Democractic Warriors. You will find that they have a strength all on their own. Sly Est eyed each member, sending fear into their eyes. The Umbaran lead council member looked at her and said plainly, "Miss Est, you have given this council nothing to decide for or against you. Sorry, but you are hereby excused from this council." Sly Est nodded elegantly and said, "The war within the Ghost Nebula will not be so kind. Your offices will not last." She turned and left. Sly Est stormed out of the Umbaran Council chambers and left the eerie building She walked into an alley way, scanned the area with her mind. Nothing. She entered the small dark room where a Killik stood. "Do it." Sly told the Killik, "We have no choice." The Killik nodded and sent his mental orders to the Hive ship Reaper within minutes a Killik Army ship would arrive with millions of Killiks. The planet Umbara would be forced into her control, but she would not allow word of this to get out. She left, with the Killik in tow. She waited outside of the Council chamers until each of them walked out. She pulled out a blaster and shot each of them dead. "I'll take that as your resignation." she said to the dead bodies. The white steps of the Council building was now stained in blood, but it would not be the first for the planet Umbara. But Sly had to move quickly to cover her deed. Sly entered the council chambers and began to execute her well formulated plan. She killed all Nebula communications and made her way towards the military command. Her eyes scanned the data then began to insert false intelligence, disrupted codes, anything to cause chaos within the ranks long enough for the Killiks to land. From there, they would destroy the tactical leadership swiftly and quickly. Sly opened a channel to two vessels. The first was the Killik warship that emerged out of hyperspace. "Killik Vessel, I am sending you the landing frequencies." The second message was to the nearest Galactic Alliance leadership flagship. It was the Chief of Security's vessel and newly added Independence II to the Alliance Fleet. This thanagarian woman would believe anything Sly fed her. "Alliance vessel, Umbara requires immediate assistance. Please come to our aide." By the time they would arrive, the Killiks will have finished their attacks and the nebula would be under her command. Sly stood and walked over to the window to watch the massive battlecruiser's troop transports head for the designated sources. The Killik commander entered the council chambers and proceeded to Sly Est. They were an odd species, but they were the only that would listen to her. They were a brave and respectable collective. "Killik, have you begun the attacks?" Sly asked overlooking her planet. "Yes, Madame, we have." the creature responded. Sly turned and they touched minds, but Sly recoiled. She respected them, but would not join them. "Kill Jaia. She will rally too many supporters." Sly said entering the Killik's tactician's mind. She watched with her own mental powers the battle that was unfolding. The military headquarters was in firefight, but the Umbaran officials surrendered sooner than expected. "Kill the anyone thats an admiral, general, major or higher." The Killik nodded and issued orders to the rest of the Killik minds. They worked efficiently and in perfect unison. Sly admired them, then withdrew from their minds protecting herself from joining their collective. The battle was closer to being finished, but several Umbarans needed to reach their demise. Throughout the Ghost Nebula, the Killiks battled against the once disturbed people of Umbara. Sly Est stood at the exact same window, for hours, watching the various battlefields play out. She was an expert at manipulation, skilled in the art of deception. It was what she did best. She had her eyes on the Galactic Alliance Senate and she would reach that goal. Nothing nor anyone could stop her secret rampage. She had succeeded in taking Umbara, although several more victories had yet to be won, she could smell victory in the air. The smell of power. It was the beginning of the end. The Killik returned, blood dripping from his hand. "We have taken the capital." A marvelous victory. Sly turned her eyes gleaming with absolute vigor. "Excellent. Proceed to Phase Two. Prepare to erase entire planetary records of this event. Bring me my most loyal servants. My fellow Umbarans." she said softly. Seventeen loyal Umbarans stood before Sly and they bowed respectfully. Sly entered a mental link with each of them. Erase radicals' memories. Create propaganda. Do whatever is neccesary to seal what happened here today. As much as possible at least. The Umbarans bowed again and left to carry out their leader's orders. The Ghost Nebula was undergoing Phase III. Sly Est would be 'democratically' elected Supreme Ruler of Umbara. Although the elections were mandatory, absolutely no other political rivals remained. Sly had no opposition and the people were terrified to vote against her. Thinking they would please their ruler, they would vote for her. Sly sent a message to the Killik war vessel requesting they begin to withdraw their vessels. Phase IV was about to commence and she needed the Killik presence less than hardly noticable. Three rented construction droids loomed over Umbara and were released to begin to fix the buildings and areas damaged. A communication officer approached her, "Polls will be in nine hours, mi'lady." Sly nodded and ushered the man away but he continued, "We have received communications from the Independence II, shall we respond?" Sly flashed him a glance and set a negative mental wave, "No. Do nothing with that vessel until it arrives here. Is that clear?" "Yes ma'am" the nervous officer stated then retreated away. Arlyn and Ryan hurried into the Chambers of the Umbaran Council. Sly Est watched them enter with a significant amount of interest. Her eyes on Ryan the entire entrance. "Mr. Davad, is it?" she called out his name.Ryan nodded eyeing Arlyn. "I would like to speak with you...alone for a moment." Arlyn nodded hoping to hurry the procedures along. "Miss. Est, I would hope no harm comes to him." Est flashed her eyes at the Thanagarian. Her mind pouring into the Angel of Geonosis,"You would hate that, wouldn't you?" Arlyn looked at the woman and was about to retort but Ryan interrupted, "Shall we?" The council along with the Alliance security force treaded back outside the council doors as Sly approached the curious wonder of Ryan. Her voice was calm and persuasive, "You are different from the others." Ryan looked between her eyes and said, "Humans are the minority aboard the Independence II." Sly shook her head once and responded coolly, "You're not human." Ryan looked at his hands then gestured his body, "Not human?" he taunted. Sly smiled, "No." Ryan gave her an annoyed glance and she continued, "You were made to look human. What are you?" Ryan looked at her with an annoyed glance then it hit him. Umbarans' special abilities. Ryan crossed his arms and responded as if bored, "I learned to shut my mind when I was a child." Sly approached him and scanned his body. "Sorry, Thanagarians only." A sly grin flashed across the Umbaran's face, "Hilarous. I didn't know droids could tell lies." She turned and walked towards her council seat, "Your maker did an impressive job, but not all minds are that quiet. I would sense emotions." Ryan sighed, "What is the point of this personal conversation." Sly was about to open her mouth but Arlyn burst through the doors, flanked by two security officers. "The war has started." Arlyn said looking at Ryan. Sly, although this was playing out exactly as she hoped, displayed a surprise look. "Chief Pallan�n, my people are willing to train under the Galactic Alliance, our abilities would do wonders for the security." Est responded to the Thanagarian's worried glance. Arlyn looked at her and said, "Bring your best men, they will be tested later. "Sly nodded and executed the order, Phase VI. Little did Arlyn know, this was playing into the Umbaran's hands exactly as she wanted. A compliment of twelve-thousand Umbaran Security Forces boarded the Independence II and left for Tatooine.